Every now and then you hear talks that astonish and fundamentally change the way you view some issue or disease state. I heard one of these at this year’s Society for Neurosurgical Anesthesia and Critical Care (http://www.snacc.org/) meeting in San Francisco in October 2007. This one was about the persistent vegetative state (PVS) and how not all may be as it seems. 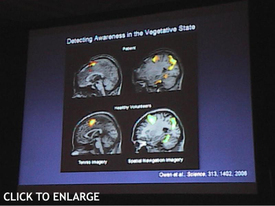 Dr Adrian M Owen of the University of Cambridge in the United Kingdom presented his studies of functional Magnetic Resonanace Imaging (fMRI) in patients in the persistent vegetative state (PVS) showing clear evidence of awareness and cognitive ability in some of these patients. ( fMRI uses the MRI to indicate areas of the brain that are active) His work has been formally published in Science 313:1402, 2006. PVS is a syndrome wherein a patient by every bedside test shows no interaction with his/her environment. The patient does not attend to any external stimuli, does not track with his/her eyes and seems totally unconscious. Families (like the Schiavo clan) however may be struck by the patient’s apparent wakefulness, lack of need for a ventilator, and persistence of ordinary vegetative bodily functions. The patient can look seductively awake but is not. Of this I was certain till I heard this talk. Dr Owen presented the fMRI method whereby various inputs to a subject in an MRI scanner can create reproducible patterns. For example tell a patient to think about something and you get a stereotypical fMRI pattern. Tell a patient to think about riding a bike or think about a specific place and different reproducible patterns of activation arise in the brain. OK… neat. The fMRI of the PVS patient is at the top and the control volunteers at the bottom. The left images are those of tennis playing imagery and on the right of spatial recollection imagery. I believe this is going to have implications for decisions about extent of life support in such patients. Certainly many(probably most) PVS patients really are in PVS. Unlike this case, I don’t expect patients with neocortical death will be responsive like this. Nonetheless it does suggest that before we make such PVS declarations that we should make sure on tests like those presented by Dr Owen that the PVS patient really is in PVS. For starts, in those patients in whom we find that PVS is really “pseudoPVS,” I expect this will be an objective measure to use for rehab. Just keep thinking about that bike riding and after awhile the physiatrists, wonder workers that they are, may be able to have the patient really bike riding or doing other cognitive things. It will tell them to not give up. So it seems that what we thought we knew for sure we’re not so sure of anymore. Déjà vu. I was the director of a large urban MICU for 25 years. I venture I saw as much anoxic damage as anyone in that time. It always amazed me how sure everyone was there was no awareness in those patients. I mean we had no way to confirm the extent of damage, no way to measure its change, in some cases no way to verify the diagnosis. We took it on faith these people could not respond because the things we did didn't make them respond. Every once in a while a family member or nurse would note somethng which we usually disregarded, especially after experiences with families that clearly, out of hope, saw things that weren't there. But we really never knew. And the pronouncements of the neurologists just seemed to confirm what we wanted to believe without objective evidence. Even in the Schiavo case, granted some of the family claims and those of some of the politicians were "out there" but the confidence of some of the other side was just as discomfiting. There is a lot to learn in this area and humility is the proper approach. I agree because of my personal experience with my PVS son Jawad Pasha who is now fully aware without motor function.Now I have come to know about another Persistent Vegetative State in Pakistan. His name is Muhammad Hussain. He is just 16 years old. He is located at somewhere in Pasheen near Quetta Pakistan. He has pressure sore(bed sore). Contracrure has developrd in his arms and feet are becomimg state due to unawareness.Still I am only on telephonic contact with the family but I talked with rhe patient and the famuly and gave them the hope. Now I have sent one peramedical to his home who is well aware due to working with my PVS son for many years. He told that the boy has started responding by blinking eyes and trying to speak. many neurologists think that these patients with pvs and who have awareness were probably misdiagnosed. I am not sure I totally believe that. However, it is also likely that there is also a percentage of PVS patients who really are unconscious and do not have awareness. anyway this work has opened our eyes to this possibility and I certainly consider it when i am around a patient with pvs. I have given my comments some six months ago and I am happy to write here that the boy (Muhammad Hussain of Pishin) has improved very much. He has started smiling even laughing on jokes sometimes, His health is now good and he is now without any bedsores. He is moving a little bit without any contolled movement and started a little eating and drinking. In my view he is too without motor function yet.